The sweater is so adorable and your dog is very handsome! I spaz out every time i see this post, cuteness overload! That is hilarious! V cute! **Disclaimer - I have never written a crochet tutorial before and did not keep any type of notes for Iggy’s Sweater. Please keep this is in mind. I frogged quite a lot of stitches to get this sweater exactly how I wanted it to fit Iggy Pup. Please don’t get discouraged and keep that puppy handy for fittings! First off - the collar. The sweater is going to start taking shape You are creating the shoulder and upper chest areas. 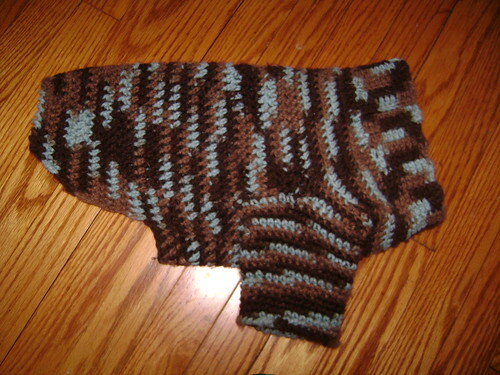 Finishing on Iggy’s sweater - I did the crab stitch on the cuff of each sleeve and on the bottom of the sweater. It added a nice finished look. ♥ Stripes - thick or thin they will add some style and interest. ♥ Embellish - add some buttons or even some crochet flowers. Great job... 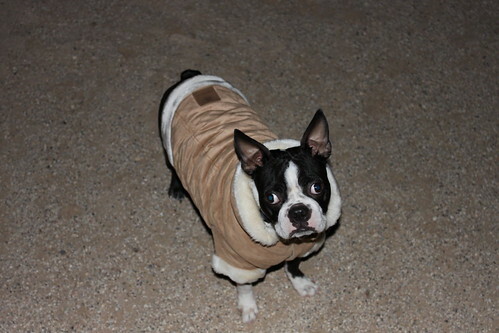 I have a crazy little 8 year old Boston named Eva... methinks she would look dandy in something like this. DIY Just saw your sweater for Iggy Pup, very nice, I bet Iggy even liked wearing it just so he could go outside and not freeze! How did you over come the "ah male" spacing issue? I have a very small Yorkie and though he has the appearance of lots of hair, doesn't have any "coat" and can't go outside when it's cold, me either, So Cal WAY to long, since the post is older and the sweater has gone through a winter walk, how did it hold up? Did any one else make one? I am a newbie to dog but am so in love oh well, those little soft brown eyes can't resist them. Thanks for any help. And thanks for the sweater pattern. hahhah I love it!! i have a boston too!!! little gus! he loves to wear sweaters in the cold too!!! i need to make him this one!! !